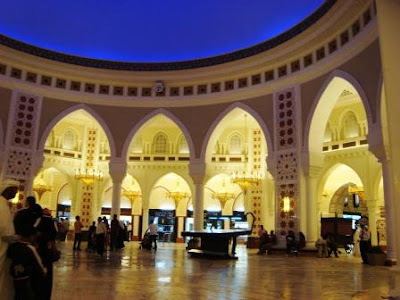 Dubai Gold Souk – Gold Rush in the Desert! The name Dubai is synonymous with gold. The majority of visitors to the city do not leave without visiting the gold markets in Dubai known as the Gold Souks. Affording designs that range from modern to traditional, gold in different hues can be found at truly amazing prices. So when visiting here plan a tour through this souk and enjoy the many shops packed with everything and anything you dream of in pure gold! It is a bustling market that has a thin walkway with over 300 jewellers on either side. As with many other shops in the city, it is open till 10 pm so visitors have plenty of time to select from the plethora of designs that vendors have to offer. Once decided what to purchase, try your luck in bringing down the price with some good bargaining! Travelling to this souk is an adventure in itself as you have to board a water taxi from Bur Dubai which docks at the Spice Souk Station. This lively site is only a five minute walk from here and is easily recognizable through the dazzling displays of endless glitter. The entrance is as magnificent as what is on display with two large wooden doors welcoming visitors in with an aura that speaks of untold mystery and riches. Whatever your choice may be, in whatever colour, you can find it all; dainty or bulky, pink or purple, it is all available here. Even if you are not into purchasing these items visiting the souk is a must experience in Dubai. You will be fascinated at all the amazing types of jewellery that range from accessories to waistbands all made out of pure gold. The UAE government has strict regulations when it comes to genuine gold so you do not have to worry about the quality of the products. With all that glitter surrounding you, it is only right to choose a hotel that reflects that dazzling ambience which can be found at Dubai luxury hotels. Millennium Plaza Hotel Dubai is one such accommodation option that also offers Dubai hotel specials that provide true value for money.